Normally these talks are bland because the speakers avoid giving any depth or detail to what they’re doing with their technology. This talk is not like that! Drago Anguelov (the lead of Waymo’s research team) talks about Waymo’s experiments with supervised imitation learning/behavioural cloning — a technique that applies supervised learning to state-action pairs from human driving. 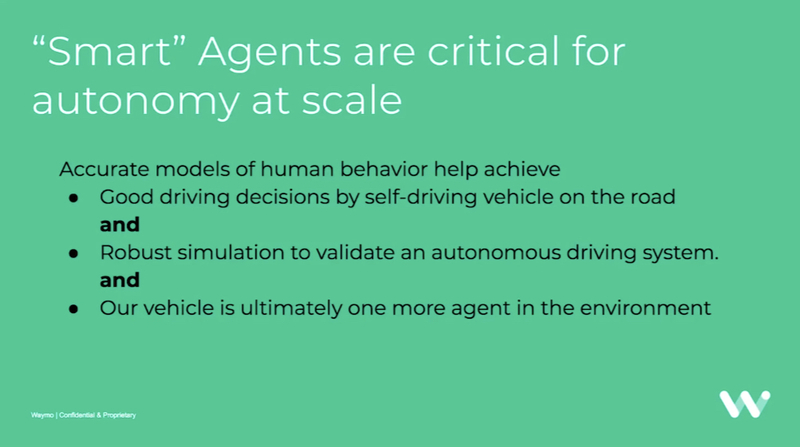 He also talks about Waymo’s trajectory optimization agent, which uses inverse reinforcement learning, another form of imitation learning. Learning from demonstration is key. You can encode some simple models by hand but ultimately the task of modelling agent behaviour is complex and it’s much better learned. Drago doesn’t explicitly talk about this, but (2) could be used to enable reinforcement learning in simulation. 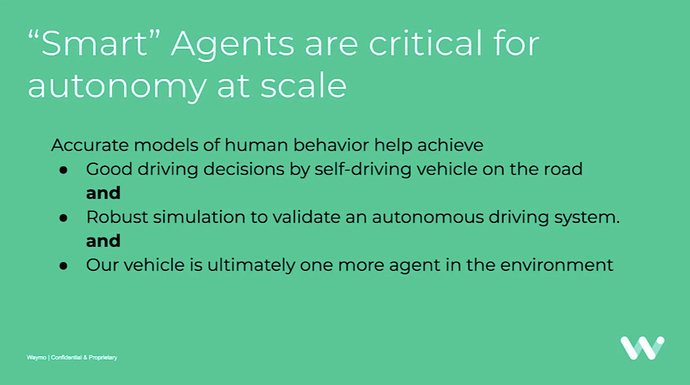 …doing RL requires that we accurately model the real-world behavior of other agents in the environment, including other vehicles, pedestrians, and cyclists. 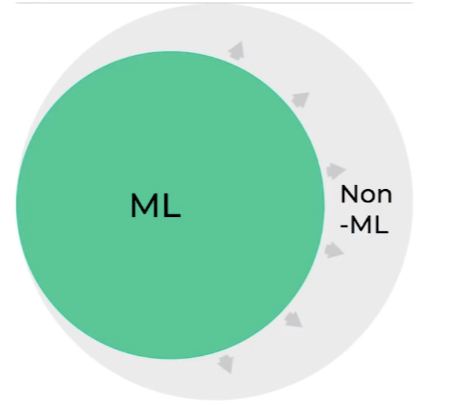 For this reason, we focus on a purely supervised learning approach in the present work, keeping in mind that our model can be used to create naturally-behaving “smart-agents” for bootstrapping RL. 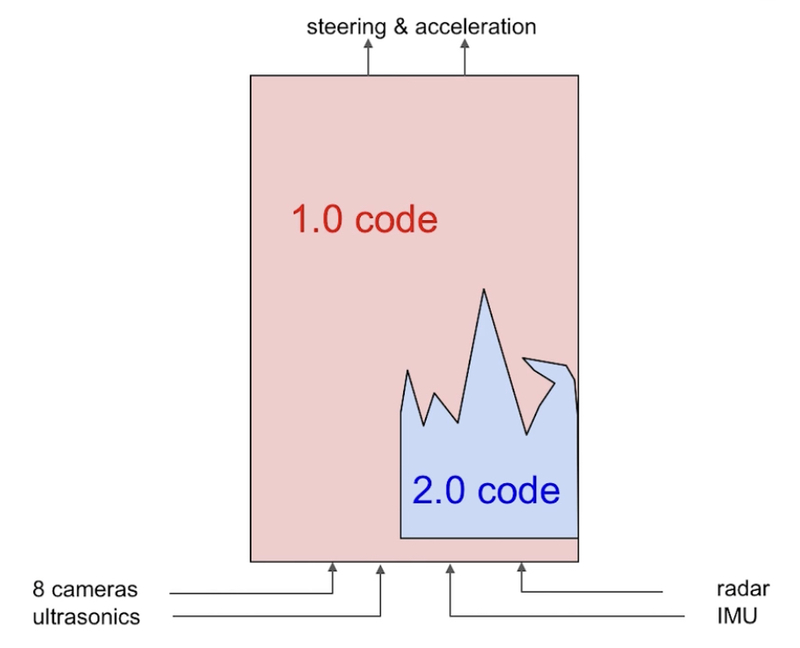 Speculation on Tesla RL: simulation-level scale scale in the real world?